Last year Norfolk and Suffolk Police got nearly 50 calls every day, about domestic abuse. 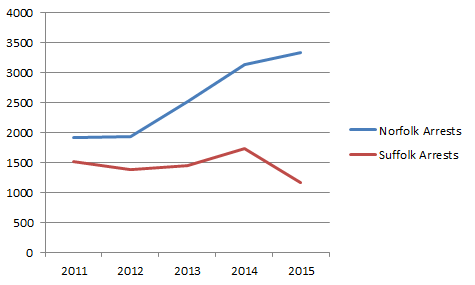 That's come from figures obtained exclusively by Heart, showing a rise in the crime here, over the last five years. You can see below the number of crimes recorded, which fluctuate over time, but total 9612 last year, or 26 a day on average. "He liked to find out my passwords, he liked to get into my phone, find out where I was. "I eventually found out I had a tracker on my car. Which answered a lot of questions as to why he always questioned where I was, what time I was home and everything like that. "If I didn't give him the correct answer, he would psychologically and emotionally abuse everything I said." He never physically or sexually attacked her, but he was controlling and possessive. "I knew it wasn't right, but I was so vulnerable. I had no where to go, I had no money. And he was so nice - sometimes." It took years before she could escape, though her story is shared by many here in East Anglia. 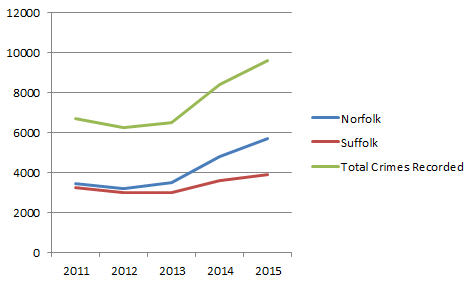 While number of crimes recorded in both counties has gone up, though in Suffolk the number of arrests has gone down. Suffolk police say they don't account for one person being charged for a number of crimes. And both forces say more reports are a good thing, as it means more victims are coming forward. Gemma told Heart much of her aid came from Leeway, a domestic abuse charity based in East Anglia.